When you work in an academic lab and are fully engaged in your research, it’s easy to overlook all of the people that provide support for your experiments and keep the lab working like a well-oiled machine. The microscope facility, the tissue culture facility, or even the dreaded sales rep that arrives with an overzealous smile peddling their wares that we so desperately need. Getting to know the people who perform these services has it’s benefits as they’re better able to help you with your experiments and it also helps you tap into a network of new people who might be willing and able to help you find a job post graduation (or post-postdoc)! One critical aspect of biomedical students’ research is DNA sequencing for things like inserting our favorite gene into a cell to determine its effect, or finding out whether a gene contains a mutation. 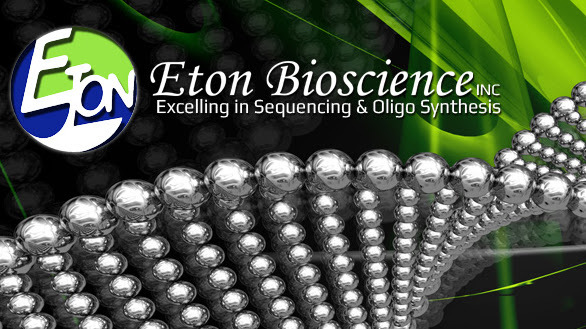 There are several companies and core university services that perform DNA sequencing, but lately, my company of choice has been Eton Bioscience. With customer service being at the forefront of their business model, I often see folks from Eton Bioscience around campus picking up DNA samples and personally delivering oligos. I sat down with Dean Brayboy, the regional account manager of the Raleigh-Durham Branch of Eton Bio, to get to know a bit more about his company, him, and how came to work Eton. Why? it’s always valuable to know someone. What is Eton Bioscience, Inc? Eton Bioscience is located in the Research Triangle Park, and has multiple other locations nationwide. Eton Bioscience is a multi-branch company with locations in San Diego, Boston, New Jersey, and the Research Triangle Park in Raleigh-Durham. They specialize in DNA sequencing, oligo synthesis, and other genetic techniques, such as subcloning, plasmid mutagenesis, and gene synthesis. Additionally, Eton offers antibody development, peptide synthesis, and lentiviral generation for all of your shRNA-mediated knockdown needs. All of those techniques are molecular biology speak for determining the makeup of DNA in a sample or manipulating the genetics of a cell into doing your bidding. They have a great reputation for customer service, and reps will personally retrieve sequencing samples from labs, deliver oligos, and are more than willing to answer your questions or just shoot the breeze. Personally, I became intimately familiar with Eton Bio during the dark times of my 3rd year when I was frantically cloning and sequencing everything in sight. Early on Dean knew that he desired a career path where human health and helping people would be at the forefront of his duties, and thus he gravitated towards the health and wellness sector. Dean attended Barton College and earned a bachelor’s degree in Biology. Following graduation, he decided to put his business acumen to use and he managed a nutrition store and worked as a personal trainer for a time. Now, in his role at Eton, he relies on both his knowledge of biology and his business skills to provide support for research at all of the local universities, hospitals, and biotech companies. He’s also just a genuinely nice guy who’s interested to learn about the research his clients are doing and how Eton’s services can help answer their individual research questions. Finally, a fun little aside, he’s the lead singer in a cover band, and last I heard, they were looking for a band name, so if you’ve got some suggestions, leave a comment. Dean reads The Pipettepen, so perhaps he’ll use your suggestion. What does he do at Eton and how did he attain his career goals? 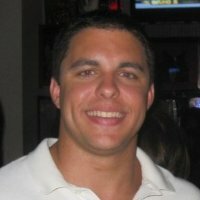 Dean is currently the regional account manager at the Eton Bioscience branch in RTP. In this role, he interacts with countless clients at both academic and private institutions in the area. He’s also in charge of training sales reps for all of the Eton branches. Dean is very much a people-person and a pro at networking. He admits that connecting with many people in many different fields and actively using LinkedIn played large roles in nailing down his job at Eton. Throughout our conversation, he stresses the importance of networking and not being afraid to talk to people. “You never know who will know somebody that could help springboard your career,” he states. What positions are available at Eton? Eton hires folks from the level of a bachelor’s degree all the way to the postdoc level for various positions. People who would like to stick with bench science might fit in well as a lab technician. There are also roles for people who would like to combine some business with their science, such as sales representatives or general branch managers. Peer edited by Zan Isgett. 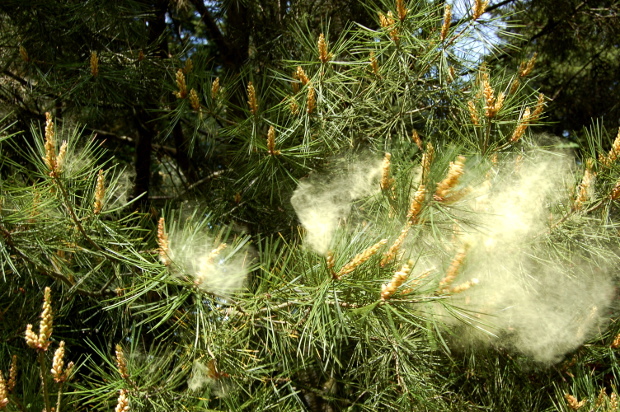 Image of pine tree pollen in flight. Photo courtesy of Amy Campion. For a few weeks every spring, Chapel Hill and Carrboro are covered in a yellow blanket of pine tree pollen and everything’s a mess. Birches, oaks, pines, and more get the signal to “spread the love” and distribute their genetic material all over the place, irritating our eyes and noses. But how do plants know when it’s time to release their pollen? You may have learned in elementary school that warm weather activates the flowering gene in plants. While temperature plays a role, it is not the only trigger. Remember that random week of warm weather we had at the end of February? Why didn’t the pine trees start distributing their pollen then? Spring ushers in longer days along with warmer weather. The amount of daylight a hemisphere receives changes as the Earth orbits the sun. In the winter, our hemisphere (the northern one) tilts away from the sun, reducing the amount of sunlit hours in the day. In the summer, our hemisphere tilts toward the sun. This means that between the winter and summer solstices, as the Northern Hemisphere transitions from tilting away from the sun to tilting towards it, the amount of daylight increases. How Earth’s axial tilt affects the seasons. The changing length of day throughout the year being a consistent phenomenon, plants have developed a mechanism that uses the amount of daylight as an indicator to flower. The photoreceptors that allow sunlight to enter and initiate photosynthesis, the process by which plants transform light into energy, also activate proteins. Thus more daylight means more protein. And once enough protein builds up, the plant gets the signal to flower. Imagine the protein as sand in an hour glass. When the sun rises, you flip the hourglass and sand begins to trickle down. After the sun sets, you flip the hourglass back over and the sand that built up during the day pours out. During the winter, all the sand that builds up during the day will empty at night because the nights last longer than the days. As you approach spring, each day the sun is up a little longer, meaning a little more sand can accumulate. At a certain point, your hourglass will build up enough sand during the day that some will still remain at the end of night. Once the protein reaches this threshold, the flowering gene in plants can activate. But what if the days have lengthened and it is still cold out? If it’s too cold there won’t be bugs or other animals around to help spread the pollen. Thus, plants also rely on the temperature as a secondary indicator. This is where things have recently started to get messy. Global climate change has reduced the number of lingering cold days in the transition from winter to spring. As a result, scientists have noticed that plants are flowering earlier, and allergy season is starting earlier and lasting longer than in previous decades. So, if you’ve noticed your nose itching sooner and you can’t seem to shake your sniffles, you’re not crazy. Fortunately, there are steps you can take to reduce your allergy symptoms while you wait for those cleansing April showers. Rain will reduce the amount of airborne pollen and wash away the pollen that blankets your car, creating little yellow rivers that will whisk away the pine trees’ genetic material. Then Chapel Hill will once again be Carolina Blue—until next year. As a scientist watched jellyfish float in Friday Harbor, Washington, he wondered what caused them to fluoresce green. It took years of determination to unravel the mystery behind the green glow, but he finally discovered that a protein, which absorbed blue light and gave off green light, was behind the fluorescence. It is the seemingly inconsequential discoveries, leading to unexpected advances in society, that are the foundation of basic science research. Unfortunately, there is a fundamental misunderstanding of how basic science research works. Out of thousands of research projects, there is no way to know in advance if the results will have value. Failure in research is likely and essential to success and scientific progress. 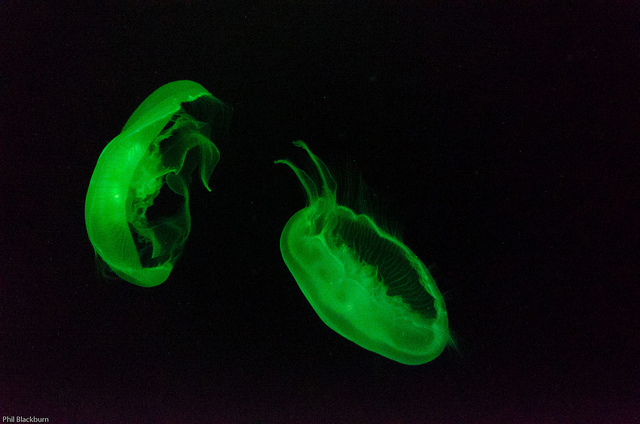 The jellyfish Aequorea victoria fluoresce green due to GFP or green fluorescence protein. Photo by Phil Blackburn. In 1975, Wisconsin senator William Proxmire began bestowing what he called The Golden Fleece Awards, which were meant to ridicule “wasteful” government spending. This award frequently targeted federally funded scientific research deemed silly or unnecessary to paint a negative picture that basic science research was a waste of time and money. Decades later a proponent of science research, House Representative Jim Cooper of Tennessee, created The Golden Goose Awards to counter this image. The Golden Goose Awards emphasize the value of federally funded basic science research using examples of seemingly obscure studies which led to major contributions in science. The first Golden Goose Award was presented in 2012 to the scientists behind the discovery of the green fluorescent protein (GFP) in jellyfish. Their discovery has lead to significant advances in molecular biology and our understanding of many human diseases. With bipartisan government support and a growing list of sponsors, the Golden Goose Awards have continued to recognize breakthrough contributions to science and society over the past five years. In 2016, the Golden Goose Award recognized a group of population studies scientists at the University of North Carolina for their pioneering longitudinal study on how social, behavioral, and environmental factors affect adolescent health. The study — called The National Longitudinal Study of Adolescent to Adult Health or Add Health for short — spans 20 years of open access research and has led to over 3,000 research publications on human health. Hopefully, with the recognition bestowed by the Golden Goose Award, the perception of basic science research will be transformed from wasteful to fundamentally important. What’s the big deal about Zika? To me, it seems that the media hypes all new disease outbreaks as the advent of the apocalypse. More often, the facts about these epidemics are simply overstated or misrepresented. 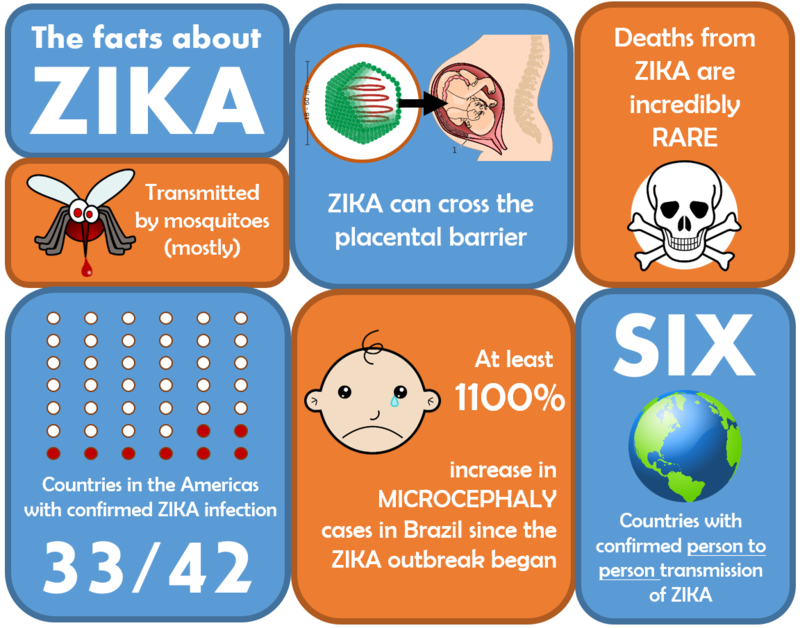 The Zika virus, also known as ZIKV, is the most recent epidemic in the news. Since early last year, there has been an outbreak of Zika fever in the Caribbean, Central, and South America, and the infection has spread rapidly since the first recorded cases in Brazil. Worryingly, reports are linking Zika to recent upsurges in birth defects and neurological conditions. Is Zika truly a virus to fear, or is this more media fear-mongering? Zika is part of a family of viruses called flaviviruses, which includes members such as West Nile, Dengue, and yellow fever viruses. Flaviviruses are typically transmitted through bites from mosquitoes. The symptoms of infection are usually mild, and can include skin rashes, low fever, muscle and joint pain, or headache. The Zika virus was first identified in 1947 in rhesus monkeys, and reports of Zika infections in humans began as early as 1952 in Uganda and Tanzania. Yet, there had been only 14 cases reported worldwide until recently; the first major outbreak began in 2007 on the Pacific Island of Yap. About 73% of residents were infected, and no deaths or hospitalizations were reported. Although the symptoms of Zika infection are mild, there is growing concern that this illness may be more than what it seems. From 2013-2014, there were outbreaks of Zika in four other Pacific Islands. In these cases, we saw the first instances suggestive of a link between Zika and an ailment known as Guillain-Barré Syndrome. Guillain-Barré Syndrome is a very rare condition in which the immune system attacks nerves, causing muscle weakness and sometimes paralysis. It is thought that bacterial or viral infections can trigger Guillain-Barré Syndrome, and in fact, during the 2013-2014 Zika outbreak, there was a rise in cases of Guillain-Barré Syndrome, suggesting that these two events may be related. However, at the same time these islands were also experiencing an outbreak of Dengue fever, which complicates this link. Yet another concern arose around the time of the first outbreak when evidence of sexual transmission of Zika virus was documented. A scientist from the United States contracted Zika in Senegal and later infected his wife upon return home. This is thought to be the first documentation of a mosquito-driven infection capable of sexual transmission, although it remains unproven. In the 2013-2014 outbreak, physicians detected Zika virus in the sperm of a patient seeking treatment for bloody sperm, which furthered suspicions of sexual transmission. To date, six countries have reported cases of person-to-person transmission of Zika virus including Argentina, Chile, France, Italy, New Zealand, and the United States. In February of 2015, Brazil notified the World Health Organization (WHO) of an unknown illness characterized by a skin rash. From February to April, roughly 7000 cases were reported with no deaths. When blood samples were taken, about 13% of them tested positive for Dengue virus. By the end of April, the majority of these samples were confirmed to contain Zika virus, and by July Brazil had confirmed cases of Zika in at least twelve of its twenty-seven states. Astoundingly, a year since the first reports of Zika in Brazil, thirty-three of forty-two countries in the Americas have confirmed cases of Zika infection. At the same time, concerns have been growing for an increase in cases of microcephaly in Brazil. Microcephaly is a rare birth defect in which a baby’s brain develops abnormally. As a result, the baby is often either born with a small head, or the head stops growing after birth. Babies with this condition can suffer from physical or learning disabilities, as well as convulsions. From the years 2001 to 2014, there was an average of 163 cases of microcephaly reported each year. However, in the last six months, there have been “a total of 6,671 cases of microcephaly and/or central nervous system malformations, including 198 deaths.” This most recent figure is somewhat misleading. Upon closer examination, WHO has investigated 2,378 of these cases and found that only 38% of the suspected cases are true cases of microcephaly. Although the rest of these suspected cases remain unconfirmed, it is clear from the cases that have already been confirmed that there has been an exceptional increase in the incidence of microcephaly. This phenomenon has currently only been reported in Brazil, but other countries are reporting increases in Guillain-Barré Syndrome. So, is there a causal link between Zika and microcephaly? The short answer is that we don’t know. A recent report in the New England Journal of Medicine confirmed that Zika virus can indeed cross the barrier between mother and child known as the placenta. Relatively few diseases can cross this barrier, but because fetuses have little to no immune system function, these types of infections can be particularly dangerous. We also know that other viruses that can cross the placenta, like West Nile, can result in similar neurological birth defects. While the exact prevalence of Zika virus in newborns and fetuses with microcephaly is unclear at this time, Zika virus has been repeatedly detected in fetal brain tissue. Additionally, in the fifteen Brazilian states with confirmed Zika virus infection, the incidence of microcephaly is 2.8 cases per 10,000 live births, whereas in the four states without confirmed Zika transmission, the incidence is 0.6 cases per 10,000 births. WHO has declared both the Zika epidemic and the clustered increases in microcephaly to be a “public health emergency of international concern.” The United States has also issued travel warnings to pregnant women. However, the common co-incidence of Zika and Dengue virus creates problems for Zika research. These viruses are often transmitted simultaneously, making it difficult to separate the independent effects of each infection. To better understand the potential link between Zika virus and birth defects, researchers are currently monitoring cohorts of pregnant women with suspected and confirmed Zika infections. There is no known treatment for Zika infection, microcephaly, or Guillain-Barré Syndrome; however, there are ongoing efforts to develop vaccines against Zika virus. Is this the end of the world as we know it? Definitely not. However, it is clear that the Zika epidemic may be more complicated than we thought. As noted climate scientist Michael Mann observes, to do climate science is to enter the “climate wars.” War is an apt descriptor for this sociopolitical milieu, in which veracious research is routinely obfuscated by entrenched interests. It is the battleground in which Exxon has been accused of coordinating “campaigns of confusion,” for decades casting doubt on the science of climate change even as company data pointed to its existence. 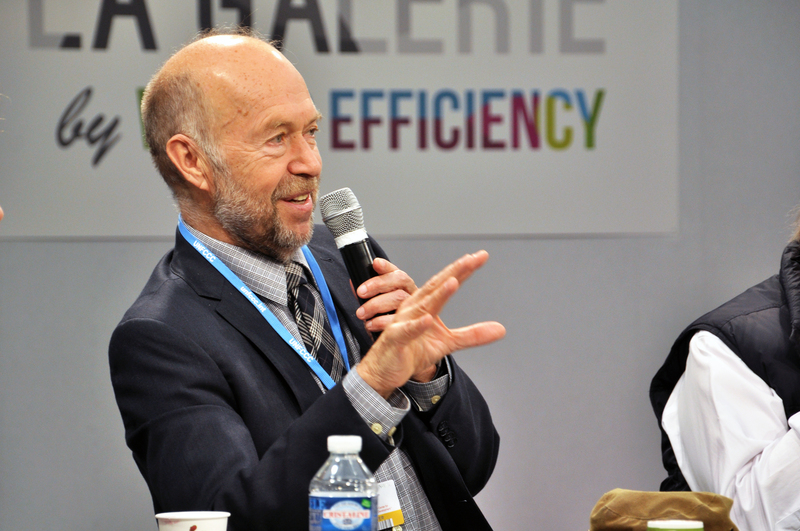 Dr. Hansen speaks at the COP 21 climate talks in Paris, December 2015.
inquiry “are explicitly designed to circumvent the errors and sins to which scientists, being human, are vulnerable.” But in the contentious political environment of the climate change era, segregating scientific pursuits from the pandemonium of the human world is not so easy. Irrespective of how meticulous and methodologically sound the science of climate researchers is, it will be denounced tendentiously by detractors. The question, according to Mann, is what scientists should do. 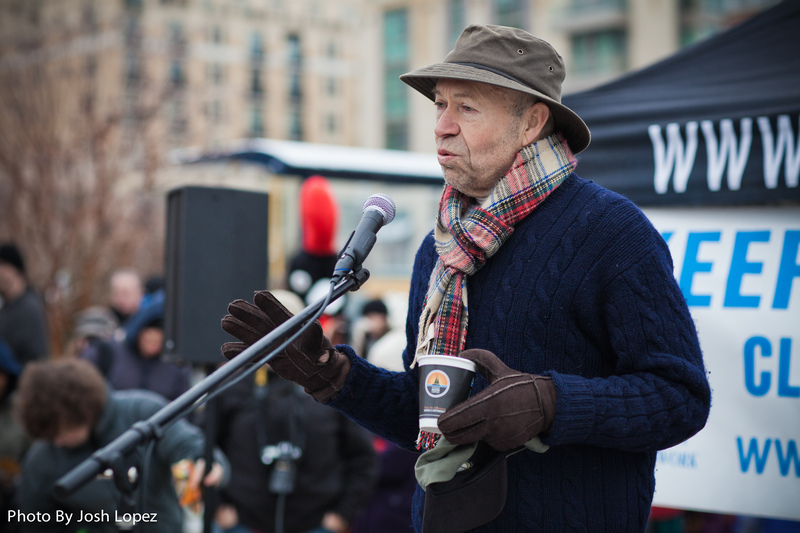 There is perhaps no more seasoned navigator of this fray than James Hansen. Hansen, now the Director of the Program on Climate Science, Awareness and Solutions at Columbia University, has been at it for awhile. In 1988, while he was the Director of the NASA Goddard Institute of Space Studies, Hansen became the first expert to testify to a Congressional committee about the need to take political action on climate change, which he claimed was anthropogenic. He has been hailed as the “father of global warming” and his reputation as one of the world’s premier climate scientists has never faltered during his decades-long career. But there is another side of Hansen: the activist and advocate. He has been an outspoken critic of the recent Paris Agreement for not taking forceful enough steps to halt the burning of fossil fuels. Similarly, he has been arrested on several occasions for demonstrating against proposed, large-scale fossil fuel projects like the Keystone XL Pipeline. Hansen exhorts other climate scientists to follow suit, stating that a concern with scientific certainty should not prevent researchers from urgently advocating political progress on the burning issues that they study. Dr. James Hansen speaking at a Chesapeake Climate Action Network Rally on January 21, 2012. Maligned by many, but lauded by more, Hansen’s biography offers an instructive example for scientists wishing to navigate the climate wars. His pathbreaking scientific papers attest to the severity of anthropogenic climate change. His indefatigable advocacy merely indicates that he takes his science seriously. To learn more about Hansen’s science and activism, check out his 2012 TED talk. As a huge Minnesota Twins fan, I was sad to hear that former catcher and current first baseman Joe Mauer is still reporting concussion-related vision problems. These symptoms stem from three years ago, when multiple concussions led to his full-time conversion from behind the plate to first base. While problems with concussions are certainly more publicized in the NFL, they are also a concern in the MLB and other sports. Single concussions rarely have long-lasting, documented effects in athletes if they are allowed sufficient time to recover. However, repeated concussions seem to be a different story altogether. Despite having no recent reported concussions, Mauer is still struggling to return to the elite level of play that he displayed before his multiple head injuries in 2013. Similarly, former teammate Justin Morneau had a childhood history of concussions playing hockey, suffered a major concussion in 2010, and has since never fully recovered his form. Why do multiple concussions seem to play such an exaggerated effect on athletic performance? Before we can understand how repeated concussions affect the brain, it’s important to understand how the use of energy is controlled in healthy brain tissue. Despite composing only 2% of the body’s mass, the brain utilizes ~20% of its energy! This energy is typically provided by the consumption of glucose, which is carried to the brain via blood flow, a process that generates ATP (one of the main energy-providing molecules in the body). The largest portion of this energy goes towards maintaining the concentration of ions, or small charged particles, inside and outside of neurons. Maintaining a constant difference between inside and outside concentrations for each ion is crucial for regular brain activity. The key player is the sodium-potassium (Na+/K+) pump, which regulates ionic transport in and out of brain cells and has been shown to consume up to 2/3 of each neuron’s available energy. Ultimately, the brain is a tightly regulated, highly energy efficient organ. Concussions impact this energy regulation process in many ways. Blunt trauma to the brain (say, caused by a foul tip of a speedy baseball into a catcher’s mask) can cause physical stretching and distortion of neurons. This allows ions to diffuse in and out of neurons without the aid of functional ion channels. In addition, excitatory neurotransmitters, such as glutamate, begin to be released at a higher rate, leading to even further accumulation of K+ ions outside of the neuron. In response, the Na+/K+ pump starts to frantically consume energy in an attempt to restore equilibrium. This energy is primarily provided via glucose. The rapid, exaggerated use of glucose causes a ‘cellular energy crisis’ in which sources of energy are dangerously low. During this state, neuron firing is suppressed throughout the brain, a phenomenon known as ‘spreading depression’. In addition, blood flow to the brain is reduced for a time following injury, preventing the restoration of ordinary energy consumption. The brain can bounce back from this injury if it is given adequate time to recover, though recovery time can vary from days to months. However, a second brain injury that occurs during these ‘cellular energy crises’ can have dire consequences. Due to decreased brain blood flow (and thus lowered glucose transport), the brain cannot compensate for further expenses of energy. As a result, ionic concentrations are difficult to maintain and more dramatic damage can occur. In particular, excessive influx of calcium ions can cause defects in neuronal function and even trigger cell death! In fact, a progressive disease, referred to as chronic traumatic encephalopathy (CTE), has been discovered in individuals who undergo repeated brain trauma. Unfortunately, overt symptoms of CTE often do not emerge until years after the multiple concussions were suffered, making early detection difficult. Instead, definitive diagnosis of CTE is performed post-mortem. 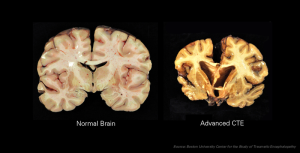 Interestingly, imaging studies in humans with CTE have revealed accumulation of the same toxic proteins seen in patients with Alzheimer’s disease. These proteins are thought to induce neuronal death, causing shrinking and distortion of brain tissue. Despite the increasing press that traumatic brain injury is receiving in the public and media, research on CTE is still in its infancy. As a result, no common treatment plan has yet been developed for CTE patients. Brain tissue from healthy patients (left) and patients who suffered from CTE (right). Repetitive head injury causes shrinking and deformity of the brain. Because concussions are notoriously difficult to treat, the MLB has taken steps to diagnose and prevent concussions that may bode well for brain health amongst professional baseball players. Furthermore, several athletes are donating their brains to aid concussion research. 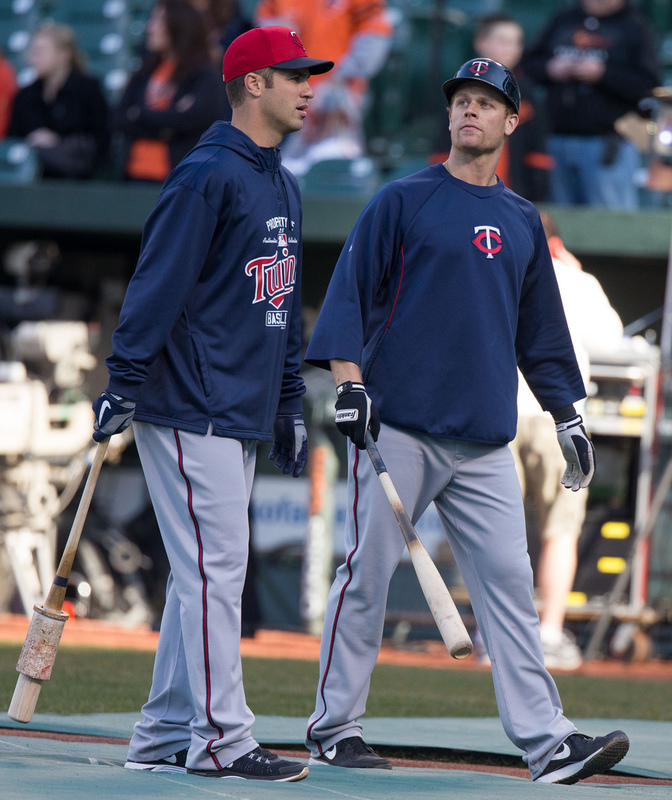 Hopefully, increased awareness of the consequences of repetitive brain injury will cause cases like Mauer and Morneau to become distant, but poignant, memories.